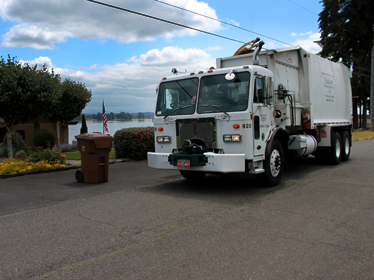 Hudson Garbage Service proudly provides top quality Columbia County, Oregon residential garbage removal and recycling in Warren, St Helens, Columbia City, Deer Island, Rainier and Clatskanie. Call 800-422-9998 to start NW Oregon residential trash and recycling service for your home. 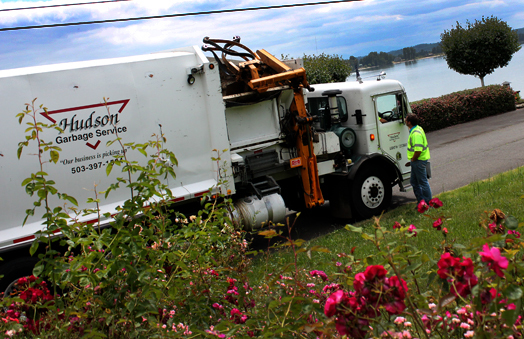 Weekly Columbia County residential garbage collection is performed on Monday through Friday. You should have your garbage container at the curb by 6am on the day it's to be picked up. Please set it at the curb and at least 3 feet away from any other cart and 6 feet away from vehicles. These are the only holidays that might affect your Columbia County trash & recycling service. If your pickup day falls on or after Christmas Day or New Year's Day, your pickup will be delayed by one day. Household Hazardous Waste items may be taken to the Columbia County Transfer Station during their HHW collection events. Medical sharps. Put in approved containers and drop off free at transfer station. *These items are accepted at our drop-off locations. See the right hand column of this page for details. Residential subscription customers are billed on the last day of every month, with payment due by the 15th. Hudson Garbage makes it easy for our Northwest Oregon residential trash and recycling customers to pay online, by phone or by mail.